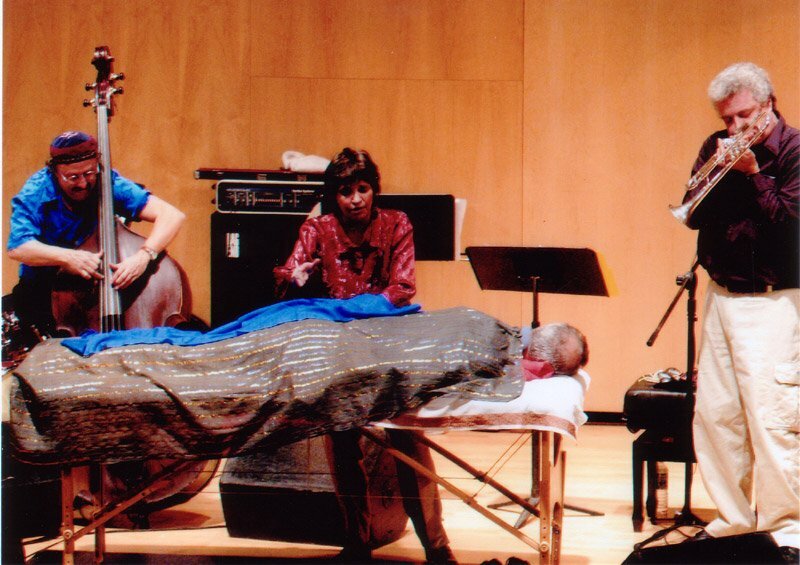 From the Source is an interdisciplinary music-performance ensemble that blurs the boundaries between music, dance and healing by engaging the unusual vocal apparitions of body healer with the percussive rhythmical cadence of a tap dancer. 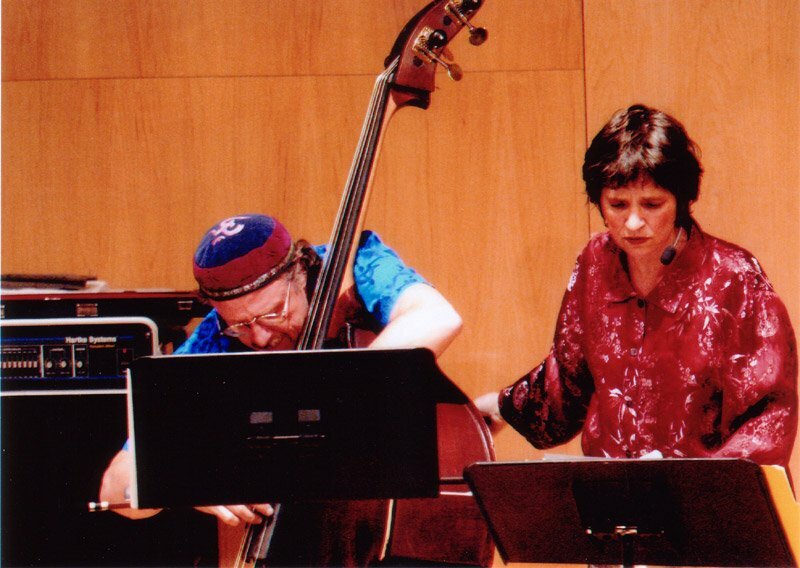 Bassist/Composer Joe Fonda integrates these unusual "musicians" with four distinguished jazz artists to create a cohesive ensemble of vocals, contrabass, saxophone, trumpet, tap percussion, and drums. Ancient music, dance, healing and spiritual practice was not thought of as separate. As a response to the alienation of a culture bombarded with fractured images and sound bites From the Source attempts to unite this unusual group of artist/healers to connect with something larger. Healer Vicki Dodd, works with cosmic sound, harmonics, overtones, vibrations, intuition and universal tongues to create a body of sound that dissolves physical and psychic blocks and attempts to awaken our collective memory. Tap dancing, which is often thought of a a popular American art form, becomes high art in world-renowned tap artist, Brenda Bufalino. Her intricate improvisations make her as much a percussionist in this ensemble as a dancer. From the Source bridges the past and the present, and moves us into the future, using sound to awaken collective memories that we have enjoyed to dislodge in the body. 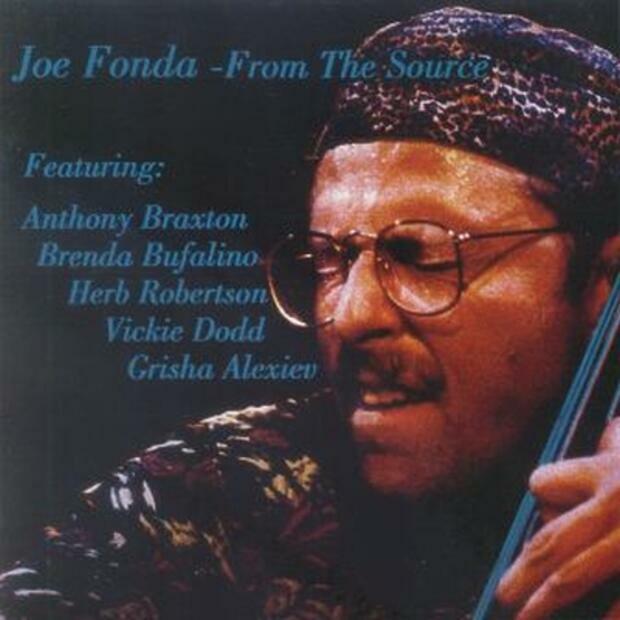 Joe Fonda, bass; Anthony Braxton, alto saxophone, sopranino, F saxophone, clarinet, contrabass clarinet, and flute; Brenda Bufalino, tap dancer; Vickie Dodd, vocals; Herb Robertson, trumpet and pocket trumpet; Grisha Alexiev, percussion Here's an outside Jazz offering that's a little further outside than most and not through merely playing louder or with more dissonance. Braxton's here, for starters, again working well with Fonda in laying down some dry, twisted melodies. But the two really trailblazing band members are Brenda Bufalino and Vickie Dodd. The former tap dances her way, literally, through the songs. Weird idea, huh? But it certainly introduces a new angle to percussion playing, as well as bringing an element of visualization to the music. And if that's not far out enough for you, there's Dodd's completely uninhibited, exceptionally creative sound-forming (I'm inclined to think she might not call it singing herself, so radically does she use her voice). For me, the cuts where Bufalino's contributions are most prominent, and where Dodd goes completely out on a limb, work the best. 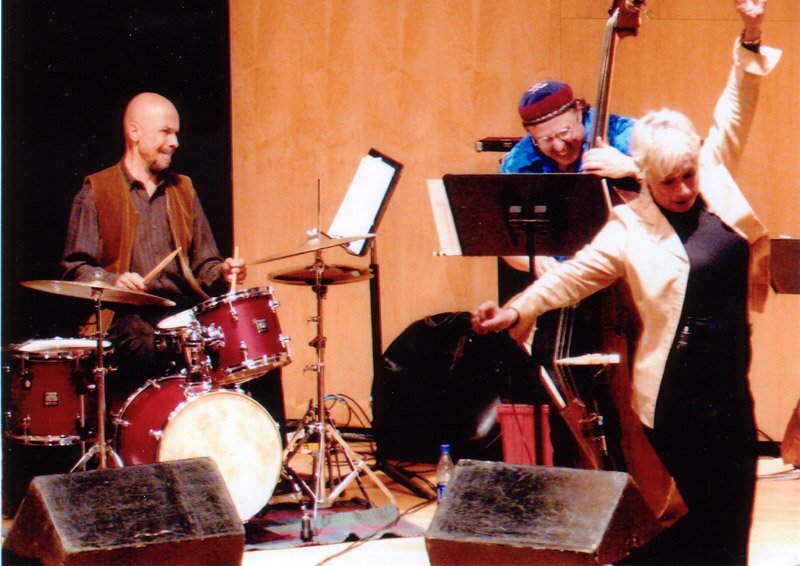 Because of ensembles like this one and Bufalino and Dodd in particular avant-garde Jazz is being made to stretch a lot further than acoustic ensembles have over the past twenty years. In an effort to expand the range of contemporary musicmaking beyond established borders, bassist Joe Fonda is going way back. From the Source explores the ritual of music in its prehistoric form, as an integral element in an interdisciplinary celebration of sound and spirit. This one-of-a-kind recording combines forward-pushing jazz by Fonda, Anthony Braxton (reeds), Herb Robertson (trumpet) and Grisha Alexiev (percussion) with the rat-a-tat polyrhythms of tap dancer Brenda Bufalino and the speaking-in-tongues of body-worker Vicki Dodd. Seamlessly complementing the more familiar musical structures, the non-lyric vocals and organic beats echo the ancient shamanistic rites of the world's indigenous cultures. This successful fusion of the healing and performing arts reacquaints listeners with the balmic and transformative powers of the deepest kind of creativity. It reconnects us to our communal-spiritual past, and suggests a future of infinite possibility. 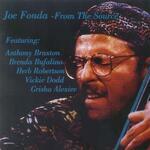 *** Bassist Joe Fonda proves his versatility as a composer and accompanist on this unique date. 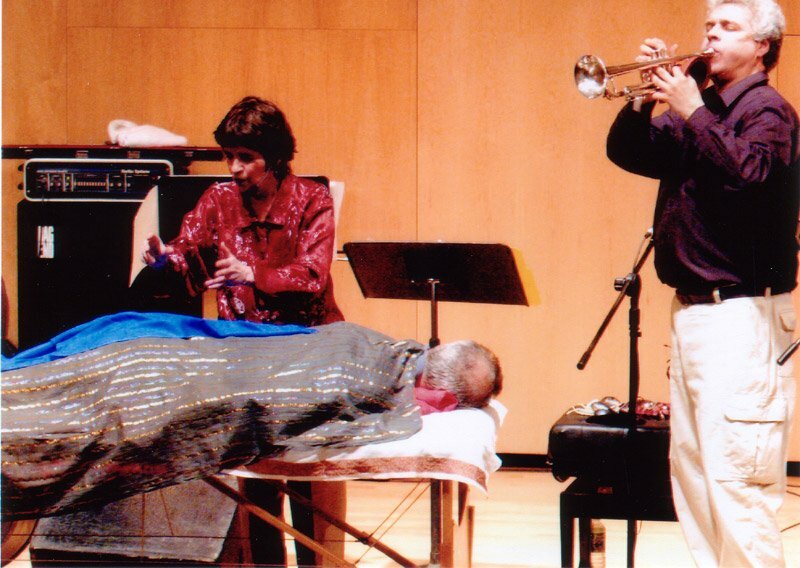 With tap dancer Brenda Bufalino and throat singer-vocalist Vicki Dodd in a sextet featuring Anthony Braxton and trumpeter Herb Robertson, the ensemble sound is unlike any you've ever heard. Yet the quality of the compositions and the performances make this disc more than just an oddity; Fonda is a serious seeker of new musical horizons, and he's clearly thought about ways to deploy his musicians and work to their strengths. "Something about the Past" drifts slowly through contrasting tone colors from Braxton's many reeds, the short, dry clicks of the taps, Robertson's kaleidoscopic use of mutes, and a wide variety of vocals sounds. For more variety, there's the medium groove of "High Tech #1," which features some sensitive group improvisation and a flute solo accompanied by voice and tap. Fonda's feature on "My Song" highlights his rich tone, clear articulation, and lyrical imagination. Fonda's liner notes speak of his utopian social agenda in bringing together men and women as equals in an ensemble that also integrates dance and the healing arts (vocalist Dodd is a body therapist). Certainly all the elements on this date — musical and otherwise — work together for an album of uncommon warmth and intelligence.